THIS MEANS WAR is a triple threat film, full of action, comedy and romance! In that same vein, this feature will highlight other great films that also offer a triple threat of entertainment, including Knight and Day, Mr. & Mrs. Smith, and The Bounty Hunter. They are the CIA’s best, trained for any situation…except one. Twentieth Century Fox Home Entertainment plays the ultimate spy game as two best friends fight for the right of one woman’s hand in THIS MEANS WAR. Starring Academy Award® winner Reese Witherspoon (Walk the Line), Chris Pine (Star Trek) and Tom Hardy (The Dark Knight Rises), the laugh-out-loud comedy gets even better on Blu-ray with three alternate endings that answer the question – what if she chose the other guy? The 1984 film Romancing the Stone stars Michael Douglas and Kathleen Turner as Jack and Joan, respectively. Joan is a romance novelist who travels to Colombia to rescue her sister from kidnappers who want a treasure map that Joan possesses. Joan ends up in the Colombian jungle and is pursued by the men who murdered her brother in law, but Jack, a bird exporter, saves her. What follows is an epic chase, with Jack and Joan trying to locate the treasure with their pursuers not far behind. This exciting adventure is full of action, comedy and romance, making it a perfect date movie. 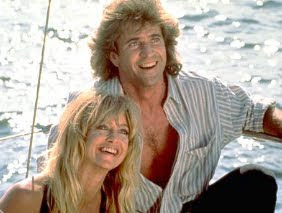 1990’s Bird on a Wire stars Goldie Hawn and Mel Gibson. Rick (Gibson) is in the witness protection program when he encounters Marianne (Hawn), his former fiancée. After Marianne accidentally blows his cover and Rick’s foes arrive for a showdown, Rick and Marianne must go on the run. Following a final fight in a zoo, a wounded Rick confesses his love for Marianne, and they marry. 2005’s Mr. & Mrs. Smith stars Brad Pitt and Angelina Jolie as a married couple that lead secret lives as assassins. When both of them as assigned to the same hit, they realize the other’s profession and botch their assignment. They are then assigned to eliminate each other, but their love wins out and they decide to work together to fight for their lives. This film is packed with adrenaline, romance and comedy! 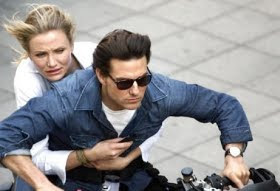 Knight and Day is a 2010 film starring Tom Cruise and Cameron Diaz. Cruise plays Roy, a spy on the run, who bumps into June (Diaz) at an airport. Once aboard a flight together, June learns that the flight was filled with people wanting to capture of kill Roy and that Roy has, in turn, killed them all. Following this first encounter, Roy continues to rescue June is a series of action packed and daring escapes and shootouts. Guys will love this movie for the excellent action sequences, and women will love the complicated romance between Roy and June. The Bounty Hunter is a 2010 film starring Jennifer Aniston and Gerard Butler as Milo and Nicole, respectively. Milo is a bounty hunter who is hired to apprehend his wife, who has skipped out on her bond hearing in order to chase an important story. Both Milo and Nicole are being followed by criminals and are nearly killed in an entertaining game of cat and mouse. In the end, the couple admits their love for one another following a hilarious and action packed journey. Triple Threat movies, packed with romance, comedy and action are perfect for date nights in, with engaging plots that will keep everyone happy and entertained, even better when a love triangle is incorporated into the story. That's What She Said readers should keep an eye out for a chance to win a DVD copy of This Mean War later this week and are encouraged to check out the Top 10 Things To Consider and Top 10 Angry Love Songs list, as well! Which of the movies above is your favorite? Is there a great Triple Threat movie that is tops on your list that is not listed here? I received an advanced screening copy of This Means War from 20th Century Fox Entertainment and/or its representatives for the purposes of creating this feature. This opinions above are both honest and my own. Some information and images sourced from Fox Entertainment. My favorite is Mr. & Mrs.Smith. i have never seen any of these.... LOL i'm terrible! Probably the best triple threat movies that I love are the James Bond 007 movies. The best triple threat movie here in The Bounty Hunter! Its one of my favorites! The best Triple Threat movie is Mr. amd Mts. Smith! I absolutely love Mr & Mrs Smith!! Mine would be the Bounty Hunter because it had so much great humor!